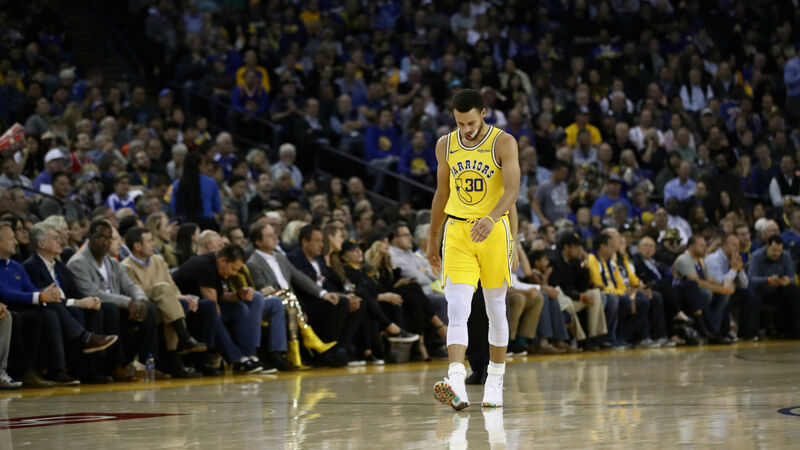 Steve Kerr refused to blame injuries, even one to star Stephen Curry, for the end of the Warriors' eight-game winning streak Thursday. The Bucks beat the NBA champions, 134-111, as Golden State lost at home for the first time this season with Draymond Green (sprained toe) out and Curry leaving in the third quarter with a left adductor strain. "I'm not nervous. I have nothing to go off of. If this was an ankle, I could tell you four days, 12 days," Curry told The Undefeated after the game (via ESPN.com). "But I will see [Friday]. … I've honestly never done this before, so I have nothing to go off of." Asked for an early read on Curry's groin strain, Kerr told reporters after the game: "I don't [have an update]. I think he's going to get an MRI [Friday]." But the coach's main concern was with Golden State's complacency as it fell to 10-2, hoping the loss to the Bucks (9-2) will provide a reminder of the difficulties of the NBA. "I don't think it had to do with Draymond [being absent]. It had to do with our overall focus," Kerr said. "Obviously Draymond gives us everything that he does, but when you come out with a mindless intent and you're fouling and not executing against a really good team — a team that's hungry and on the rise — you're not going to fare very well. "It was about our approach. Sometimes you've got to get hit in the mouth in this league to remind you how hard it is to win a game. I think that's what happened. "I think we got a little complacent. We won the last eight, were feeling pretty good about ourselves, and it's one of those nights. It happens during the NBA season. "It's a long year and we were playing a great team who lost just two nights ago in Portland [against the Trail Blazers]. "They were hungry to get out there and I thought they played exceptionally well defensively. We didn't execute well enough to generate any momentum and get our crowd into the game."